These faithful reproductions of W. Britain figures made in the early 1900’s are the inaugural sets of the new Archive Collection. Each set is reproduced faithfully down to the shades of paint, style of painting and even the classic burgundy Britains half box with figures tied in. 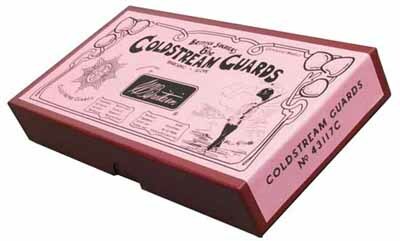 A Fred Whisstock style label on period pastel paper complete the replica packaging. Please note that the only variation in these figures to the originals is that they are not hollowcast (with lead safety restrictions today it is not possible to make a truly hollowcast figure anymore) but leadfree solid cast figures. Browse these categories under "Archive Collection"
Featured products under "Archive Collection"
Released August 2012! Limited Edition of 400!